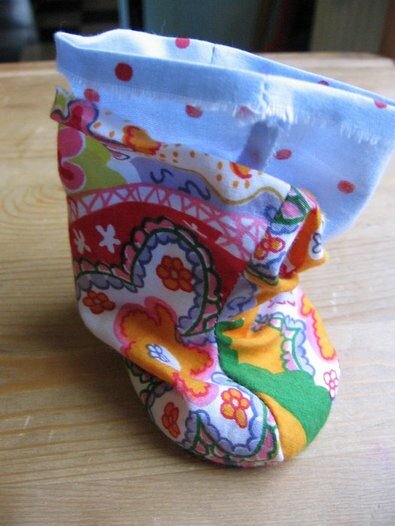 My Weblog: Baby boots... Crash ? Here goes, I'm going to try and do this but my computer keeps crashing, if there are any glaring errors I'll put them right asap. Here comes a poor quality photo again, I still haven't sussed out what's wrong with the scanner. Enlarge to whatever size you wish, just measure the length of baby's ( or Mama's ) foot. 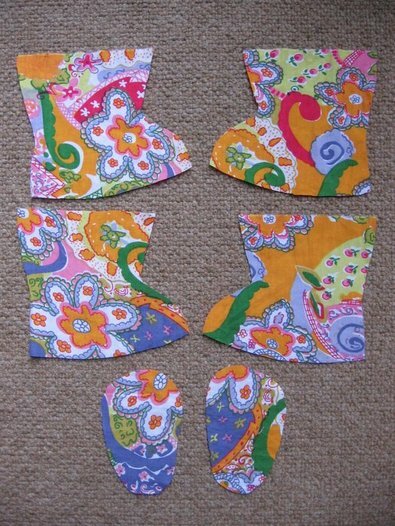 Cut 4 boot pieces and 2 sole pieces as shown. Now do the same for the lining. 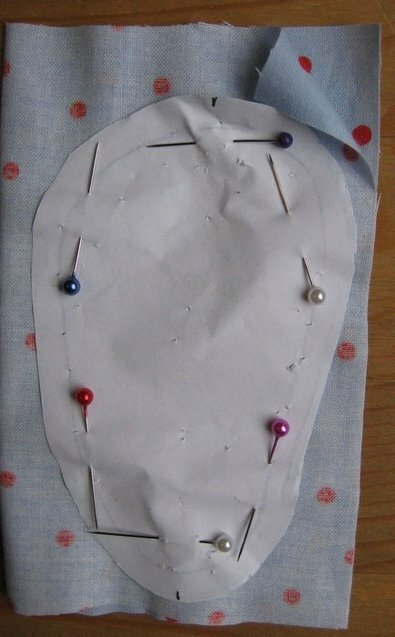 The easiest way to do this is to lay your fabric right sides together, and then pin and cut out together. 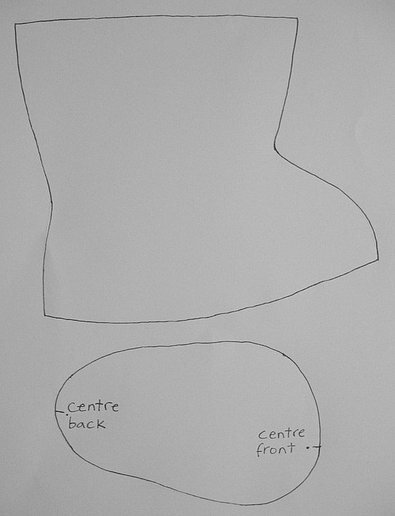 And then stitch the boot to the sole as shown, don't forget to mark the front and back centre points on the soles - it makes it a lot easier to position correctly. 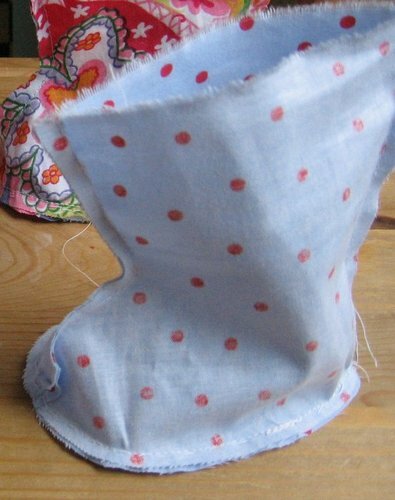 Now turn under and press a small hem at the top of each boot and it's lining. and maybe some yo-yo's. There's a great tutorial at Heather's. 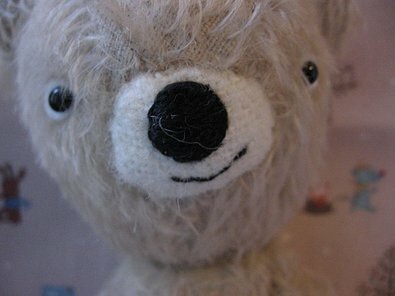 I'm planning on having the shop ready on Tuesday, there will be some small bears ( boys and girls ),a bunny, some purses, and some odds and sods. Have a sooper dooper weekend. it's been 1 of those magical days - school's out because of a gas leak so no teaching today. instead i went out specially to get fabric to make these for a friend's soon to be arrival.. i've waited patiently all day for the pattern and now i'm all excited, think i'll make a pair for me too! Oooooooooo, the shop is coming!!!! Will there just be a link on here to it or are you going for the Ebay thing? Can't wait, I want want want a little boy bear!!!!!!! You're a great artist and a great teacher. I am looking forward to a shop update. I love the spirit of your blog. You are so awesome at putting together tutorials and helping us all have fun! Thank you. These are so adorable...now, if I only knew which we were having in 10 days...grandson or granddaughter...I could get busy with some of these sweet things with the yoyos..or without, if a boy. Thanks much for the tut..
so that explains where's you bean. beautiful! Thanks so much for the tutorial, I can't wait to make a pair. You make these look so easy. the pink ones the other day were so cute too! thank you so much for posting the pattern. Great boots! Can't wait to make them. súper! están hermosos... thank you! Oh those are soooo stinkin' cute!!!! Thanks for the tutorial!! Oh bless you, bless you, bless you. Do you know how close I was to buying a pair in this style today for a RIDICULOUS sum?? I touched them and shoved them back. They weren't as good as yours anyhow. And now I come home and find this on your blog. Thank you so much for sharing. Oh my, TOO precious. Thanks for the tute! how cool! 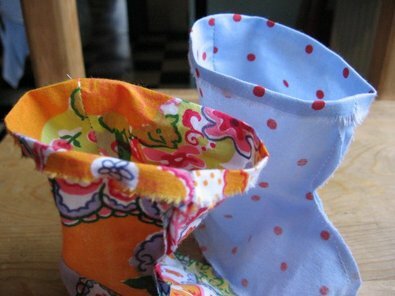 thank you for the tutorial, it will be fun making these for my friends baby to be. Thank you for sharing the pattern. They are sooo gorgeous! I can't wait to get started - just have to wait for winter to come (it's summer over here)! huum sorry CUTE not quite. please add me to your mailing list for the shop, I would love to buy something from you! Very cute boots/booties. Make it look very easy and fun to do. Well I hope you have a sooper dooper weekend to, well what is left of it anyway. thank you for showing us how to make such a great thing! I am always looking for projects with a little more guidance than maybe some folks need as a lot of this is new territory for me. Thanks for sharing this project. I will definitely give it a try after Christmas! Thank you for that great tutorial! I LOVE your blog an everything you make! Thank you so for sharing. Your site is one of my favorites! Thanks for the tute, another project to add to my 42 already waiting!!! Lynne, you are a gem. Hello, I've made the booties. I had some difficults for stitch the sole. Do you sew them with a strech point? oh those boots are too cute! They could also be done with suede bottoms that go over the toe just a bit. And I love the crooked smile on your bear. Great blog! You really make it look easy. I'm sure it's not but I'm going to try a pair for my 2 month old. Thank you! 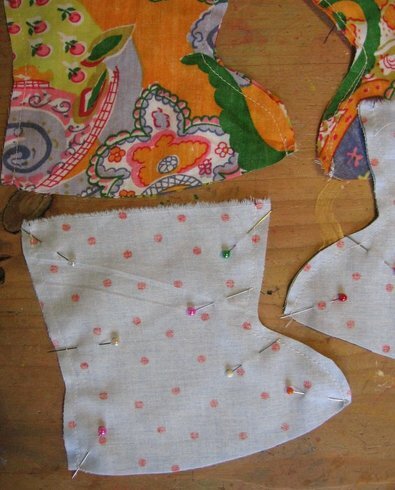 Ooooh I can't wait for a quiet moment to try and make these booties. Thank you. Although it may be some time before a quiet moment arrives, first I will enjoy Christmas and go wild with the kiddies. Wow, what a great tutorial. 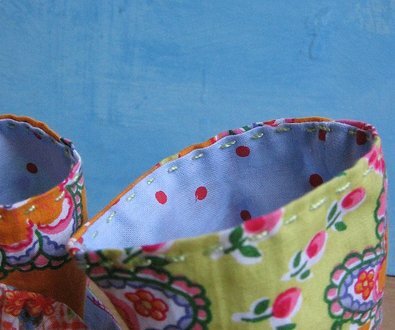 I've just started learning how to sew and expand my creative knowledge, and this is such a fabulous project for me to try. Thanks! I LOVE those booties! They are so precious and baby boho. Thanks for sharing them! I know it's too late for the latest sweet bears, but how does one get to your shop? Must be prepared for future offerings! oh how cute this is. Cool BLOG, very informative contents. I also have a blog similar like yours. Would you mind if I ask you for a link exchange? Does anyone how what the measurements would be for a newborn baby? 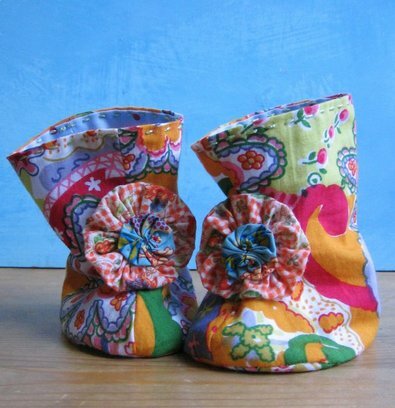 I have lots of fabric that would be so cute used for these baby boots but have no idea of what the measurements would be...I would love to add them to my ever growing pile of gifts for my niece who is due in April. Thank you for everything esp. for posting such a great idea!! Wow I really like it....Your Idea very cool""
These are tooooo cute!! Thanks so much for the tutorial. I sat down this afternoon and made a pair. Check them out. hello i was wondering if you could tell me where i could get that great fabric that you used to make these booties in the pics?? love them!!! Thanks for this! Such a great tutorial. hi thank you for this! It helps a lot. hope you will post exact sizes for different ages. You are so awesome at putting together tutorials and helping us all have fun!